Former Dallas Cowboys running back Joseph Randle has been arrested for the sixth time in the past 17 months. Randle, 24, was arrested and booked into the Sedgwick County Jail in Kansas at 1:44 a.m. Sunday for failure to appear in court. He is being held on $150,000 bail. Randle posted bail last week after being charged with three counts of aggravated battery, one count of drug possession (marijuana) and one count of criminal damage to property after he was arrested in Wichita, Kan., on Feb. 21. The Cowboys released Randle in early November reportedly due in part to his involvement in sports gambling. Randle has denied the allegation. Randle, a Wichita native, was arrested on Feb. 1 on a speeding charge after showing up at the home of his former girlfriend in Irving, Texas. Police said Randle was arrested when an outstanding misdemeanor warrant was discovered. On Nov. 25, Randle was arrested following an altercation at a Kansas casino. He was booked on suspicion of criminal threat, assault of a law enforcement officer, battery, disorderly conduct, criminal trespass, disorderly conduct and interference with a law enforcement officer. The NFL investigated Randle’s arrest last year in February in Wichita. Police refused to pursue charges against him in a domestic disturbance complaint, but the NFL’s investigators determined that Randle violated league policies. Randle, a 2013 fifth-round pick out of Oklahoma State, was suspended four games by the NFL on Nov. 10 under the league’s personal conduct policy one week after he was released by the Cowboys. In October 2014, Randle was in legal trouble related to a shoplifting arrest for stealing underwear and cologne. 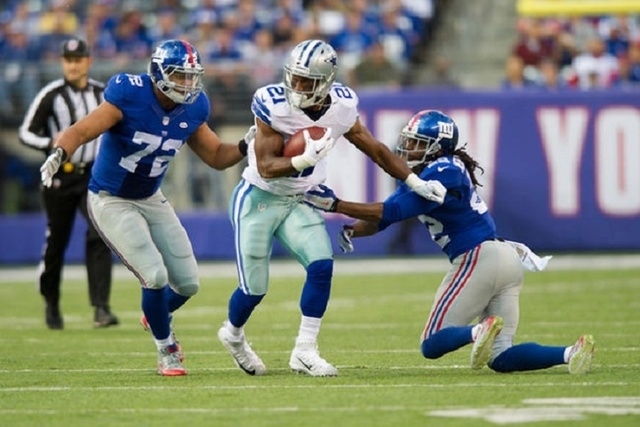 In six games for the Cowboys in 2015, Randle rushed for 315 yards and four touchdowns on 76 carries. He added 10 receptions for 86 yards. Since joining the Cowboys in 2013, Randle played in 35 games and rushed for 822 yards and nine touchdowns.